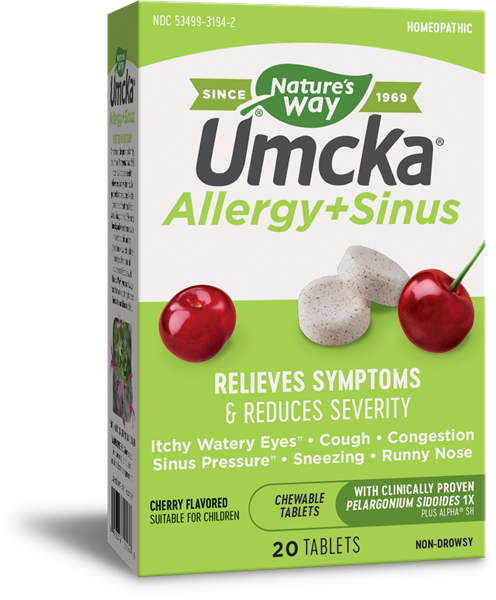 Umcka® Allergy & Sinus - Nature's Way®. Clinically tested Umcka® (Pelargonium sidoides 1X) plus Alpha® SH combined into one complete, multi-action allergy††, sinus†† and cold formula. Pelargonium sidoides 1X roots originate from traditional South African medicine. Umcka® (Pelargonium sidoides 1X) does more than just relieve common cold symptoms—it actually speeds your recovery time. Umcka® (Pelargonium sidoides 1X) is proven e­ffective in clinical studies for alleviating common colds plus nasal, throat and bronchial irritations. Alpha® SH (Hydrastis canadensis 6X, Kali muriaticum 3X, Pulsatilla 3X, Sanguinaria canadensis 6X, Silicea 6X) provides multi-symptom allergy and sinus relief††. Adults & children 12 years of age and older: Take 1 chewable tablet 3 times daily. Children 6-11 years of age: Take 1 chewable tablet 2 times daily. Homeopathic - Shortens the duration and reduces the severity of common cold, nasal, throat, and bronchial irritations.